Amazon Fire TV Stick with Alexa (2017) review | What Hi-Fi? The development of talking technology isn’t as recent as you might think. In 1773 Christian Kratzenstein built a speaking machine using tubes and organ pipes to make artificial vocal chords; and in 1939 the first electronic speech synthesizer called VODER (Voice Operating DEmonstratoR) said the words “Good evening, radio audience” at the New York World’s Fair. But at this point in tech history, the voice assistant du jour is Amazon’s Alexa – and its inclusion in the new Fire TV Stick is the most obvious change between the now-discontinued 2015 version and this new iteration. Alexa mainly makes it easier to do three things: the first is menu navigation. By pressing the microphone button on top of the remote, you can command your Fire TV Stick to search for a particular actor, director, or film genre. To its credit, the Stick’s voice recognition is pretty good, and names such as ‘Chiwetel Ejiofor or Nikolaj Coster-Waldau’ don’t confuse it. The second plus is being able to control your videos a little better. Say “fast forward five minutes” while watching Amazon Prime content, and it will skip ahead. Unfortunately, this only works for Amazon’s own content – Netflix and other streaming services still rely on the conventional buttons to rewind or skip episodes. Finally, because the Fire TV Stick will be connected to your wireless network – there aren’t any ports on its body apart from the Micro USB it uses for power – you can use it to manage any Internet of Things products you might have, such as smart-lights or thermostats. Since you have to press a button on the remote rather than calling out a wake word, it isn’t quite as easy to use as Amazon Echo but having the Alexa function is still a neat addition. You also have the option, if you go into the Stick’s wireless settings, to connect a pair of Bluetooth headphones or speakers to it in case you wanted to improve on your TV’s sound or avoid disturbing others. Connecting up the device is simple: plug it into your TVs HDMI slot, connect to wi-fi, and blast through the short installation videos. The only thing that might take you some time is logging into all your services and clicking your way through various emails and passwords using the Stick’s remote. We’d recommend downloading the Fire TV Stick app for iOS and Android instead (which also has the Alexa functionality) as using your phone’s keyboard is much faster. Apart from Alexa, the other major upgrade Amazon has made is the quad-core processor that means the Stick is more responsive than its predecessor. There’s also Amazon’s Advanced Streaming and Prediction (ASAP) for its Prime Video service, which learns your tastes and pre-buffers shows it thinks you might watch next. Moving through menus certainly feels quick and precise, and on our own wi-fi network content loaded relatively quickly. Amazon’s new UI is also happy to give some space to other streaming services, although its own Prime channels predictably take centre-stage. On top of the operating system is a menu for the home page, recent movies and TV shows from Amazon and other streaming services, as well as the Apps and Settings pages. Next is a medley of your recent apps in well-sized tiles, followed by your downloads, which you can change the order of – prioritising the apps you use the most. After that are content recommendations, which become more specific as time goes on. While the old Fire TV Stick lacked a few catch-up apps, the new one now has access to the expected broadcasters. BBC iPlayer, ITV Hub, All 4 and My5 are available to download, as well as Netflix and YouTube. Video content will be in 1080p quality, and up to Dolby Digital Plus 7.1 channel sound. If you want 4K content from Amazon or Netflix, you’ll have to go for the new Amazon Fire TV Stick 4K, which costs just £10 more than this. You can also download games to the Stick’s internal memory, and purchase a separate games controller for £35, as you could with the old Fire TV Stick. But just how well does it perform? Using a stream of Netflix’s How To Get Away With Murder as a test, the Stick performs well. The picture is as crisp and detailed as we would expect at this price and resolution, with suitable insight to the dark scenes and pop in bright colours. It’s got a pretty good sound to it too. Speech is clear, without any extra tonal emphasis towards the high or the low range, and it’s pretty detailed too. There’s enough emotion in the angry debates between lawyers and tension in the soundtrack. The differences between Annalise Keating’s (Viola Davis) whispered council and her loud declarations are dynamic enough as well. As the old saying goes, “If it ain’t broke, don’t fix it”. 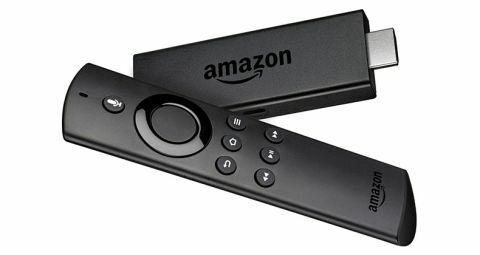 Amazon’s previous Fire TV Stick received five stars from us and, since the core design of this one remains similar, the 2017 version receives the same accolades. But do bear in mind that for just £10 extra you can have the new 4K version. Even if you don't yet have a 4K display, it may be worth spending that little bit extra for the extra little bit of future-proofing.